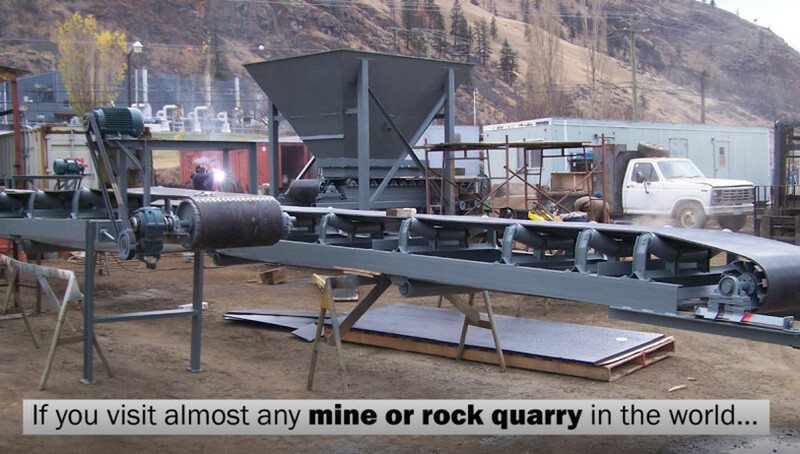 If you visit almost any mine or rock quarry in the world you will likely find a conveyor system integrated into the operation. Some are simple and used to transport material 50 meters from the crushers to a loading area, others are complex systems that carry various material with a wide range of densities through the entire process. Conveyors are engineered and designed to withstand different types of materials, environments, and even running time (some run several times per day, others 24 hours). In almost all industrial operations conveyors are made of industrial grade belting, steel trusses and angle iron, magnetic pulleys, idlers, and are powered by large electric motors and manufactured for the client's specific needs. 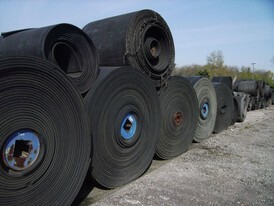 The belt on the conveyor determines how wide the material can be or the maximum width of fine material able to be transported. 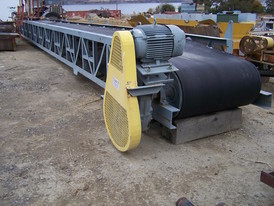 The length of the conveyor not only determines how far the material will be transported but the types of pulleys, idlers, and steel that will be required. Distance also has a direct effect on the size of motor that will be required to keep the belt moving as it fills with the material. If a conveyor is carrying lighter materials buyers will often purchase a channel conveyor which has a simpler design, uses less steel but if used for the right purpose can still last for years. Conveyors built with channel have less support than other designs so they are also generally used for transporting over short distances and on flat surfaces. 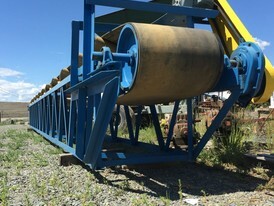 Conveyors for Heavy material and longer distances. When a channel conveyor doesn’t cut it the next most common type is a truss conveyor. They are designed and manufactured to carry large and dense materials over a longer distance and for are also common for transporting material up to a higher level. 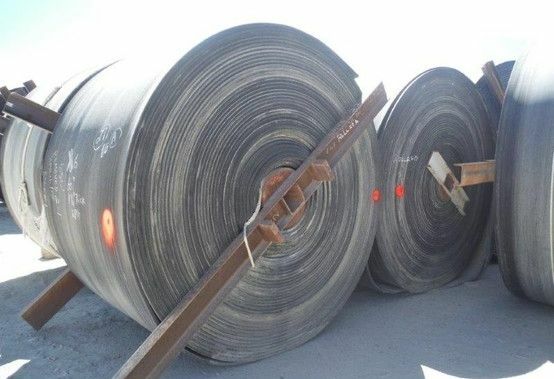 The crossing steel channel frame provides extra support and stability that keep the conveyor from not only bending but also twisting and damaging idlers, belting, or pulleys that would result in hours of downtime and could cost thousands or even millions of dollars. 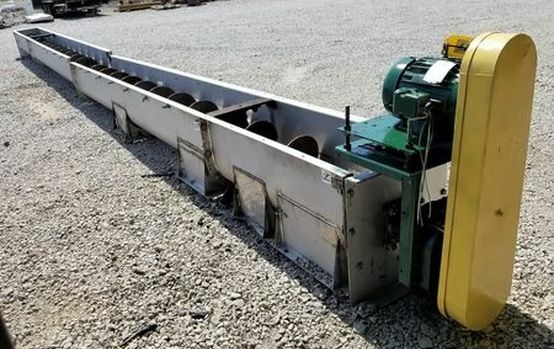 The correct term for a portable conveyor is a Radial Stacking Conveyors and they can be used in a wide variety of applications from gravel pits to sawmills. Some can be hooked to a truck or machine and pulled from one location to another, others have wheels aligned to swivel in a circular pattern. Some portable stacking conveyor designs even allow you to fold the conveyor to allow easier and safer transportation of the unit. But they all share the same principle, to allow the material to be deposited into multiple locations using the same conveyor. Portable conveyors are almost always used to transport material on an incline to their destination. Often these conveyors use specially designed belting that has a cleated, rough top, diamond top, or extruded pattern to avoid material rollback or slippage. Trucks and trains are expensive and often inconsistent. 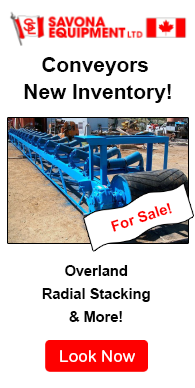 Overland Conveyor Systems are often the most efficient and cost-effective method of transporting large amounts of material over long distances. They can stretch miles and depend on the material are open or encased to keep material contained. 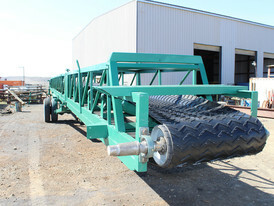 The design of an overland conveyor is completely dependant on what is being transported. In different industrial sectors, you will see simple designs for light material and large heavy-duty truss designs to handle large, bulky, and dense materials. In many processing plants, the liquid is either added or is naturally mixed with the raw material making a standard belt conveyor useless for transporting even over short distances. 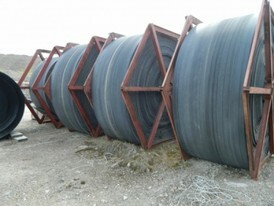 Screw conveyors were designed as the solution to these applications. 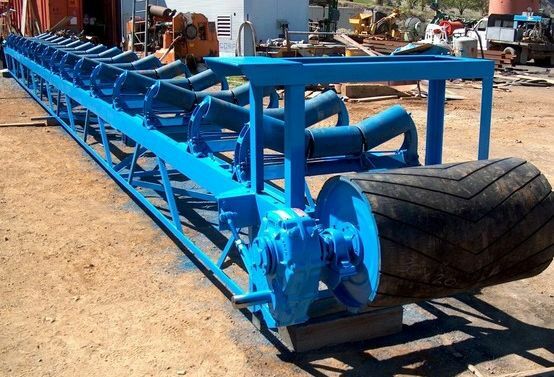 Auger conveyors or transfer augers move liquid or granular materials in various bulk handling industries from water treatment, to mines, and agriculture. 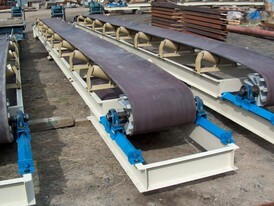 However, auger conveyors also move semi-solid materials that are dry but difficult to manage on an open conveyor belt. 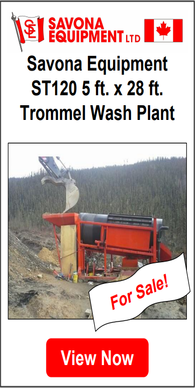 Different uses will range from wood chip plants to food processors. Operating with auger conveying systems allow for better control of the material. Like any technology conveyors, systems continue their advancement. Electronic monitoring of material and the conveyor itself is becoming more common and can save companies huge amounts of capital by decreasing downtime and serious damage to the conveyor. Overland conveyor systems will safely transport material for miles to shipping ports and complex ore processing plants run 24 hours per day using a combination of modern and tried and tested conveying methods. Watching a conveyor run from the distance may seem simple but the closer you get the more you realize it is an intricate machine essential to the operations it works in. Still not sure which conveyors to buy? Contact us with your requirement.